In May,2009 I was able to take a trip to England, got my first passport and was a real tourist. I visited the town of Bath since bathing is one of my favorite things. Could you imagine bathing in a place like this – it was called The Great Bath. We had a tour guide who was dressed as a Roman Legionaire and walked us through all the various rooms. There were rooms that were set aside for different temperatures- for tepid water tepidarium, another one for warmer water caldarium, one for hot water aconicum and lastly a cold pool frigidarium. There were dressing rooms, rooms for exercise, massage and classrooms. What an amazing experience! I would also want to add, yields an insight into the inner nature of the soul of that period. 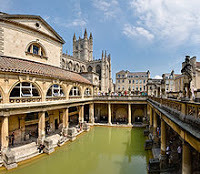 Greek and Roman times promoted baths and bathing as a way to general good health and to relieve ailments such as rheumatism and digestive disorders.We all know that a good soak in the tub with epsom salts helps tired and sore muscles and rejuvenates the body and calms the spirit. In this time of jumping into the shower and then jumping out and rushing to get dressed and out the door we have lost that ritual of the bath. I feel we have also lost that time to connect with ourselves also. We don’t need an elaborate building to create this space but we can close the bathroom door, run some water, light a candle and play some music and enjoy our time to reinvent for our selves a ritual for the bath. So what is holding you back?